Pleural effusion is a known complication of continuous ambulatory peritoneal dialysis (CAPD). We present the case of a patient who had recurrent right pleural effusion while on automated peritoneal dialysis (APD) that resolved when intermittent hemodialysis (IHD) was instituted. A 54-year-old male presented with new-onset right pleural effusion. He had a history of metastatic squamous cell carcinoma of the right tonsil for which he underwent chemoradiation therapy, and he had been recently diagnosed with end-stage renal disease requiring dialysis because of polycystic kidney disease. He was originally started on IHD but was changed to CAPD at his request. After a few months of CAPD, the patient was switched to APD to minimize his dialysis time and improve his quality of life. Two weeks after he started APD, the patient complained of shortness of breath. Chest imaging confirmed moderate right pleural effusion. Diagnostic and therapeutic thoracentesis was performed. Pleural fluid analysis demonstrated transudative pleural effusion with a pleural fluid glucose level of 256 mg/dL. The gradient between the pleural fluid glucose and the serum glucose was >100 mg/dL without cytological evidence of malignant cells. Pleural effusion attributable to intraabdominal dialysate leakage into the pleural space through a transdiaphragmatic defect was highly suspect. Consequently, APD was temporarily converted to IHD with resolution of symptoms. After 2 weeks of IHD, APD was reinstituted, and the right pleural effusion recurred. Repeat thoracentesis demonstrated a pleural fluid profile similar to that of the previous occurrence. Because of his comorbidities, the patient declined other invasive treatment options. He decided to resume IHD, and the right pleural effusion completely resolved. This case demonstrates the occurrence of pleural effusion with APD that did not occur when the patient was on CAPD. The incidence of pleural effusion in association with CAPD ranges from 2%-10%, particularly right pleural effusion with an incidence of up to 88%.1 The incidence of left pleural effusion attributable to diaphragmatic defect is lower because the pericardium covers the defect and prevents peritoneal fluid leakage into the left pleural space. The pathophysiology of developing pleural effusion in patients on APD could be explained by the presence of a transdiaphragmatic defect or the higher pleuroperitoneal pressure gradient caused by the gravitational effect of lying supine at night with the intraabdominal cavity containing dialysate during APD instead of being in the recumbent position of CAPD. Also, pumping the dialysate with APD increases the pressure gradient between the peritoneal and pleural space that can worsen the leakage through a transdiaphragmatic defect. The diagnosis of right pleural effusion from leakage of peritoneal dialysate is highly suspicious when the gradient between the pleural fluid glucose and the serum glucose is >100 mg/dL.2 The lower glucose gradient does not preclude intraperitoneal dialysate leakage because the pleural mesothelial cells could metabolize the pleural fluid glucose. In such circumstances, imaging studies (eg, peritoneal scintigraphy) are required to demonstrate the transdiaphragmatic defect. First-line treatments are temporary cessation of peritoneal dialysis or low-volume exchange.3 If conservative management is unsuccessful, minimal invasive procedures such as video-assisted thoracoscopic surgery (VATS) with chemical pleurodesis or direct suturing of the transdiaphragmatic defect with or without a Teflon patch might allow the patient to continue on APD.4 Open thoracotomy for pleurectomy or mechanical pleural abrasion is rarely performed because the advantage of VATS compared to traditional thoracotomy has been well documented. We emphasize the importance of looking beyond the common etiologies of transudative pleural effusion, such as decompensated congestive heart failure, nephrotic syndrome, hepatic hydrothorax, or hypoalbuminemia, and considering the type of peritoneal dialysis being performed. A systematic review by Rabindranath et al reported no difference in mortality, hospitalization, and incidence of peritonitis between APD and CAPD, but APD is associated with improved quality of life.5 The question of whether the intraabdominal pressure in APD is higher than CAPD and complicates right pleural effusion in patients with transdiaphragmatic defect requires further investigation. Central line placement is a life-saving procedure commonly performed in the intensive care unit (ICU) for various indications, including intravenous fluid resuscitation, hemodynamic monitoring, vasopressor infusion, hemodialysis, and parenteral nutrition. Complications have occurred after central line placement, such as arrhythmia, pneumothorax, and vascular injury. We describe a case of iatrogenic guidewire retention in the inferior vena cava, show the chest x-ray finding, and identify preventive measures to avoid this complication. We emphasize that physicians must learn the abnormal chest x-ray of guidewire retention and interpret the chest x-ray after central line placement themselves to avoid a delayed diagnosis of guidewire retention. A 92-year-old woman was admitted to the ICU with a diagnosis of septic shock from urosepsis that occurred after outpatient lithotripsy and right ureteral stent placement. Physical examination was significant for high-grade temperature, hypotension, and tachycardia. Laboratory findings were significant for leukocytosis and serum lactate of 6 mmol/L. A right internal jugular vein central line was cannulated with the Seldinger technique (insertion of a catheter over a flexible J-point guidewire) for administration of vasopressors and intravenous fluid. A routine chest x-ray postprocedure was done (Figure 1). Upon chart review, we learned that the patient had been admitted to the ICU 2 months earlier with a similar diagnosis of a right ureteral stone complicated by acute pyelonephritis and septic shock requiring central line placement through the right femoral vein by an emergency department training physician at 3:00 am. Chest x-ray during that admission revealed a similar radiographic finding (Figure 2). The diagnosis of iatrogenic guidewire retention was established. The guidewire was successfully removed by interventional radiology under fluoroscopy without complication. 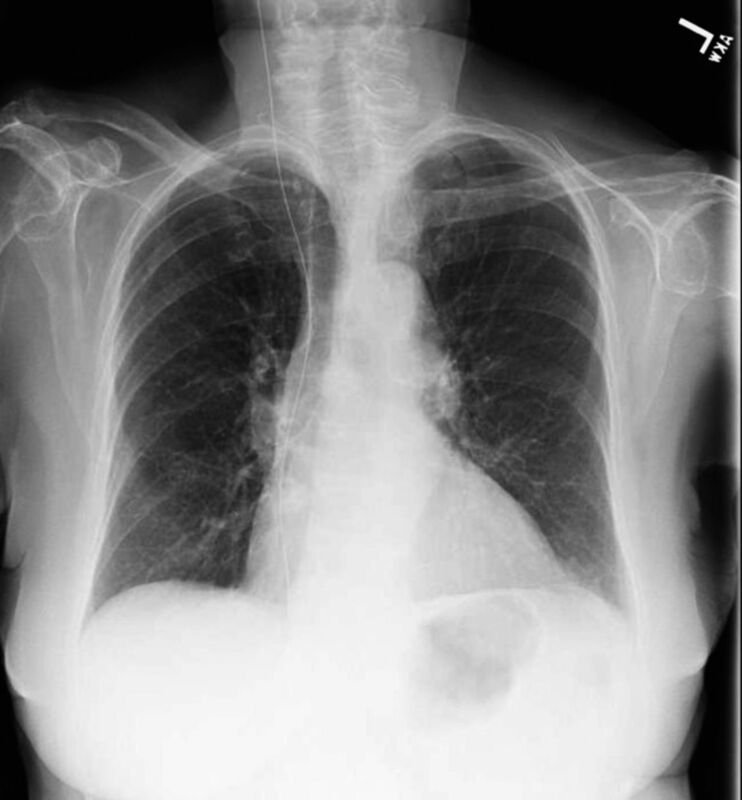 Chest x-ray postprocedure shows a metal-opaque structure with a J-point projecting toward the right lung apex extending distally into the abdomen, below the lower limits of the radiographic examination. The right neck central line tip projects at the superior vena cava. An official reading from radiology reported as a catheter extends over the right neck, right paraspinal region into the right upper abdomen and out of the field of view, which misled the physicians who read the report without interpreting the actual image. 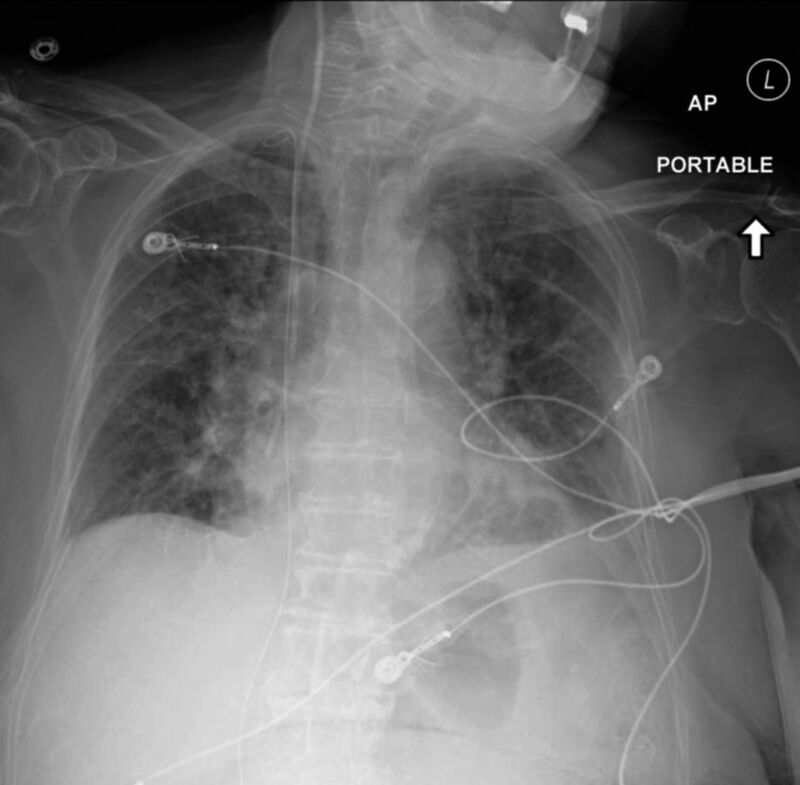 When reviewing the chest x-ray after central line placement, physicians must confirm the position of the line, the absence of pneumothorax, and potential iatrogenic guidewire retention. Guidewire retention from any site of cannulation could lead to a mortality rate up to 20%.1 Retention can occur when the physician does not hold the proximal end of the guidewire all the time during cannulation of the central line and the wire is not properly removed from the venous lumen. Generally, guidewire retention is not recognized immediately after central line placement. The guidewire could be left in the circulation up to 17 months without symptoms.2 Factors contributing to guidewire retention include physician inexperience, inadequate supervision, a hastily performed procedure, and overworked house staff physicians.3 Completing a checklist postprocedure with the nursing staff is imperative to confirm that all the equipment is accounted for, including the appropriate disposal of the guidewire. The radiologist should notify the physician directly of abnormal findings. In addition, reviewing previous chest images is mandatory to determine if the complication occurred after the previous procedure as for this patient. A delayed diagnosis of a retained guidewire during central venous catheterisation: a case report and review of the literature. BMJ Case Rep. 2012 Nov 19;2012. doi: 10.1136/bcr-2012-007064.